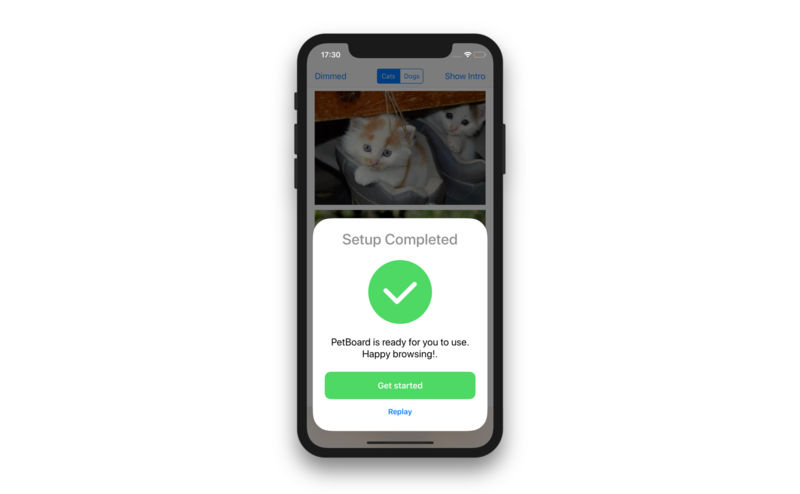 BulletinBoard is an iOS library that generates and manages contextual cards displayed at the bottom of the screen. It is especially well suited for quick user interactions such as onboarding screens or configuration. It has an interface similar to the cards displayed by iOS for AirPods, Apple TV/HomePod configuration and NFC tag scanning. It supports both the iPhone, iPhone X and the iPad. It has built-in support for accessibility features such as VoiceOver and Switch Control. 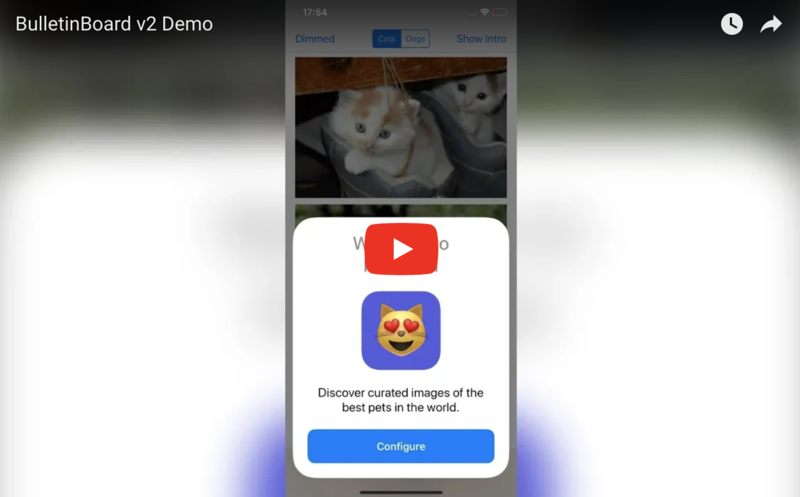 Build and run the scheme for your favorite language to open the demo app. BulletinBoard is available via CocoaPods and Carthage. BulletinBoard is fully compatible with Objective-C. The BLTNManager class generates, manages and displays bulletin cards. Cards are created using bulletin items. Bulletin items are objects that conform to the BLTNItem protocol. The library provides a standard item type: BLTNPageItem. If you need to customize the items, you can override this class, or create new item types from scratch. To display bulletins you first need to create the root item to display (explained in the next sections). With this root item, you need to create a BLTNManager. We recommend putting it in the view controller that will display the bulletin. 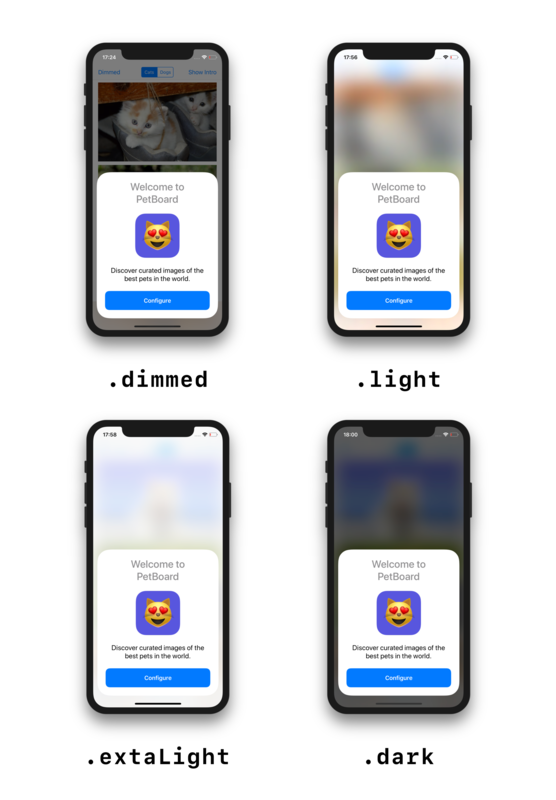 For the case of onboarding, you can call it in viewWillAppear(animated:) after checking if the user has already completed onboarding. You can create standard page items using the BLTNPageItem class. 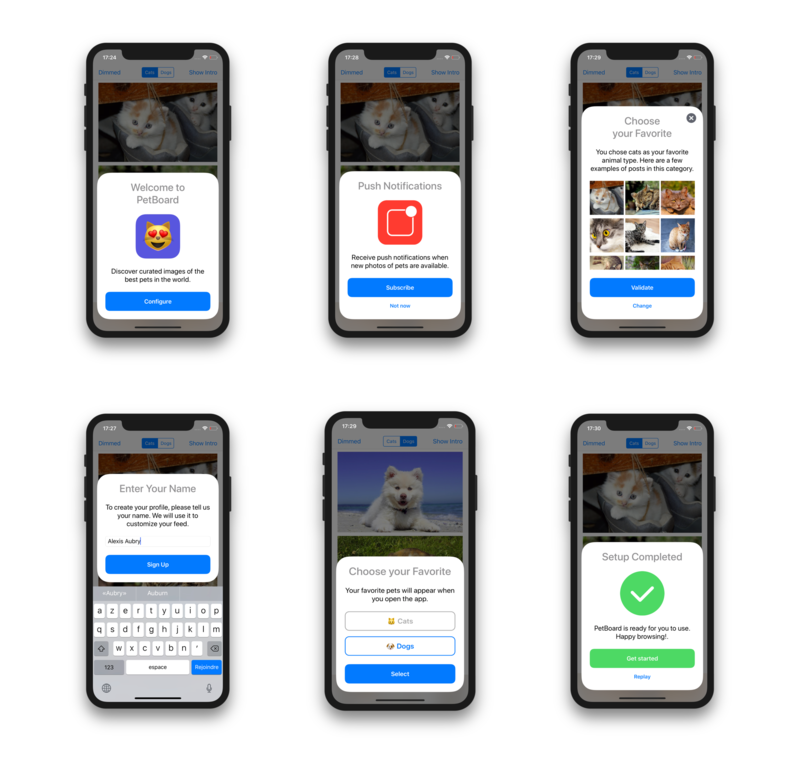 page.descriptionText = "Receive push notifications when new photos of pets are available." If you omit an optional property, the page won’t generate a view for it. For instance, if you set alternativeButtonTitle to nil, the card won’t display an alternative button. You can also set the attributedDescriptionText if you want to use an attributed string. 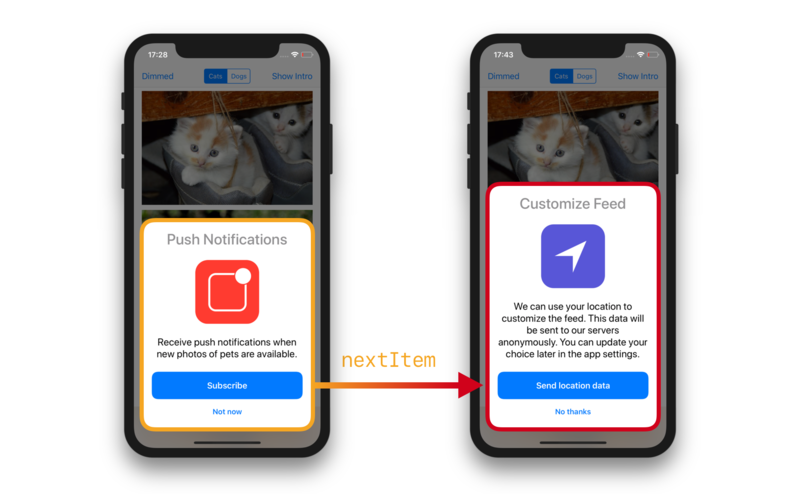 The BLTNPageItem class exposes a appearance property that allows you to fully customize the appearance of the generated interface. This property references a BLTNAppearance, which is used to generate the standard components (more on this later). You can customize both color and fonts. You need to change these before you present / push the item. Changing them after presentation will have no effect. actionHandler - called when the action button is tapped. alternativeHandler - called when the alternative button is tapped. This prints "Action button tapped" when the action button is tapped. This prints "Alternative button tapped" when the alternative button is tapped. Use these handlers as an opportunity to change the presented item, dismiss the bulletin and/or pass data to your model. The BLTNItem protocol exposes a manager property that is set when the item is currently being displayed by a manager. You need to call these methods from the main thread. Never force unwrap manager, as this property will be unset as soon as the item is removed from the bulletin. It is also possible to set the nextItem property to the BLTNItem that should be displayed next and call the displayNextItem() method when you want to display it. 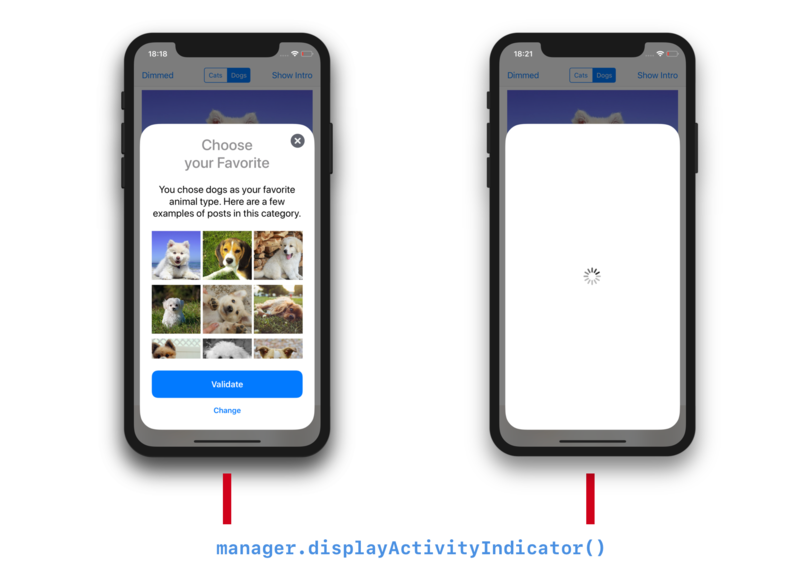 If you need to perform a task between the moment the user taps a button and the moment you’ll be able to change the presented item, you can call displayActivityIndicator() method on the item manager to hide the current card and display an activity indicator. This is especially useful if you need to fetch data from a server (in-app purchase price, subscription status, …) or save data (e.g. Core Data). Once your task is finished, you call one of the methods described in Changing the Presented Item to display the new item, or call hideActivityIndicator() to hide the indicator without changing the item. By default, the content behind the card is covered with a semi-opaque view (known as the .dimming style). You can customize the background view by changing the backgroundViewStyle property of the manager before calling prepare(). Note: blurred backgrounds are available in iOS 10.0 and later. If you set the isDismissable property to true, the user will be able to dismiss the bulletin by tapping outside of the card or by swiping the card down. This property defaults to true. You should set this property to false if completing the task is required, and should not be avoided by the user. By default, a close button will be displayed when the item can be dismissed. If you don’t want this behavior, you can set the requiresCloseButton property to false. This is useful when the bulletin already provides an action button to close the item (such as a “Done“ button). To create custom bulletin items, create a class that implements the BLTNItem protocol. It is usually easier to subclass BLTNPageItem and implement one of the hook methods to provide your custom views to display with standard elements. See the Creating a Custom Item guide to learn more. BulletinBoard uses stack views and Auto Layout to display and manage cards. It automatically adapts to changes in width and height. iPad and iPhone X are supported out of the box. 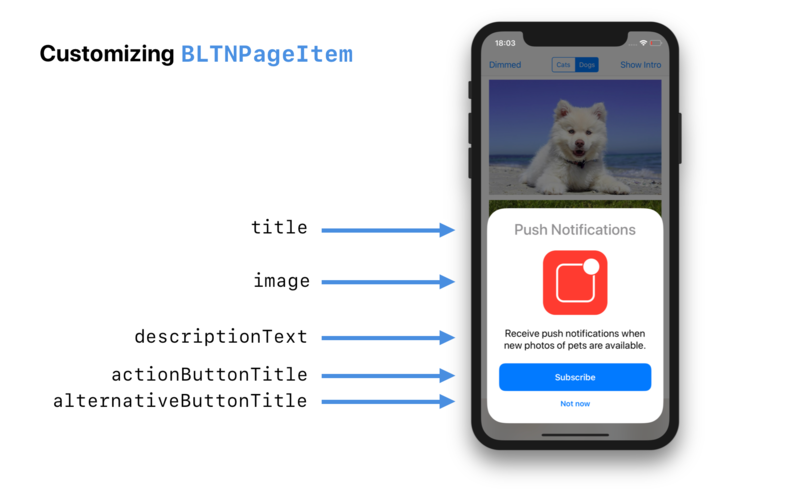 If you are interested in learning how it works in more details, look at the implementation of BLTNManager, BulletinViewController and BLTNInterfaceBuilder. Thank you for your interest in the project! Contributions are welcome and appreciated. Feel free to submit a PR if you’re using this library in your apps. Written by Alexis Aubry. You can find me on Twitter. BulletinBoard is available under the MIT license. See the LICENSE file for more info. Copyright © 2017 - present Alexis Aubry. Available under the MIT License. Generated by jazzy ♪♫ v0.9.2, a Realm project.